Held at the Hotel Catalonia, Barcelona Plaza in Spain and attended by delegates from 60 countries worldwide, the GWA awarded Essilor’s Eye Can Succeed for successfully providing free eye care services to 10,000 Filipino senior high school students and distributing prescription glasses to those in need. Eye Can Succeed campaign was spearheaded by Essilor Vision Foundation (EVF), the philanthropic arm of Essilor. Dubbed “Oscars of PR”, the annual Golden World Awards is organized by the International Public Relations Association (IPRA), the leading global network for Public Relations professionals. It is the world’s most prestigious PR award-giving body that recognizes best in public relations practices worldwide in different categories. 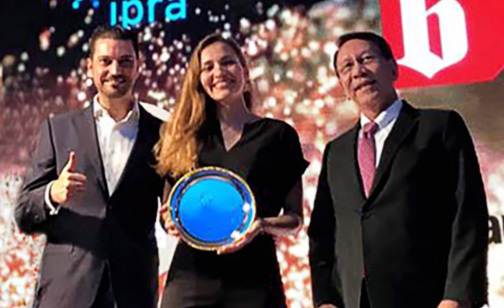 Receiving the gold award in behalf of Essilor Philippines were (from left to right) Essilor Spain Consumer and Categories marketing manager Hugo Velasco, PR manager Adriana Garcia, and FuentesManila president Edd Fuentes.